On April 13, a Nationwide Candlelight Vigil will be held in observance of the 4th annual National Day of Prayer and Protest Against Planned Parenthood. Vigils will be held outside Planned Parenthood facilities throughout the country. So far, 168 vigils have been scheduled in 40 states. Find details about each site below. Coordinating protests and vigils throughout the United States demands tremendous resources. Your gift of $10, $25, $50 or more will help #ProtestPP continue to hold these kinds of bold, powerful protests, and keep the pressure on Planned Parenthood. Click here to make your #ProtestPP gift. Sign on to Lead a Protest! 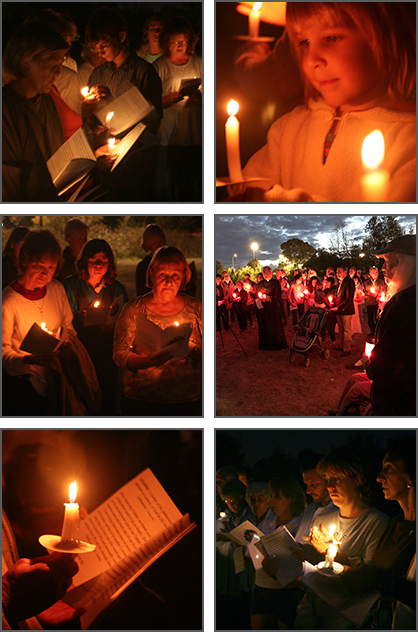 If you don't see a #ProtestPP vigil in your area, there's still time to host your own! Just fill out our Leader Signup form. To find the nearest Planned Parenthood center, go to PlannedParenthood.org and enter your zip code under "Find Health a Center." To find out about future #ProtestPP events and stay informed about the fight against Planned Parenthood, sign up for email alert from #ProtestPP. Note: Bishop Chad Zielinski will speak at this event. No vigil in your area? Why not sign on to lead a vigil April 13? Note: Gather at 10:00 a.m. at Poncitlan Square, 38315 9th Street East, Palmdale [Map]. Park behind the Palmdale main library on the SE corner of Sierra Highway and East Palmdale Blvd. We will then walk to and pray at Planned Parenthood located 2 blocks away and then return to Poncitlan Square. Note: Meet in St. John XXIII Catholic Church parking lot, 1220 University Ave. 6:00pm Life Choices Ultrasound Bus tours offered. 7:00pm: Guest Speaker Sue Thayer, former Planned Parenthood manager and current 40 Days for Life leader, followed by procession to Fort Collins Planned Parenthood for candlelight vigil until 8:30pm. Note: Parking is available on streets and in adjacent lots for Mercy Care and Pregnancy Help Center. Note: This event will consist of worship, prayer, and sign holding. Do not park in Planned Parenthood's strip mall parking lot. There is plenty of free parking in the immediate area. Note: This event will be led by Fr. Mike Murray, Fr. Gordon Riegle, and Fr. Vince Richardson. Meet at the grassy area on the West side of Clippert Street, north of Vine. Please park in the lot north of the Sears store. Do not park in the Qdoba lot. Note: Guest speaker: Pastor Jeff Noble. Public parking is available on the SE side of Farmington Road and Five Mile Road where the Livonia City buildings are located. It is a short walk to the Planned Parenthood facility located on the northwest side of Farmington Road. Note: Candles provided. Hymns, Scripture readings and prayers for an end to abortion will continue until 9:15. Note: In lieu of a candlelight vigil, this event will be a Jericho March. More information is available here. Note: Parking is across the street at Mediterranean party center. Note: Gather at Garden of Hope, 6135 E. Garden Place.